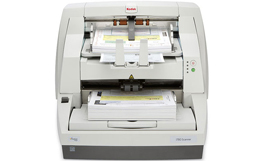 The Kodak i730 Scanner is a High-Speed Production desktop color duplex scanner with an automatic document feeder that runs at 90 pages per minute and includes an enhanced document printer. The i730 is designed to handle mission critical, production applications and is loaded with features that are optimized for production forms processing & data extraction environments while offering exceptional speed, price and performance. The i730 delivers incredible image quality with super-fast image processing technologies. Yet, the auto feeder is sensitive enough to handle fragile and lightweight paper without damage. The i730 operates at the same rated speed, even with advanced image processing features enabled. 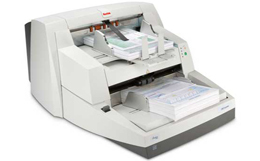 The factory-installed, front, pre-configured Enhanced Printer also operates at full scanner speed and can add a date, time, document sequential counter, and custom messages. Simply put, there is nothing but performance and precision under the hood of the i730 Scanner. Auto orientation feature analyzes document content on the fly so images are automatically displayed in correctreading orientation. Perfect Page technology gives you exceptional image quality automatically—often better than the original, even from less-than-ideal forms, photos and documents. Put an end to presorting with auto orientation—each document is instantly analyzed and displayed properly, based on content. Autofeed mixed batches of up to 500 documents, forms, photos, and graphics - from 2.5" x 2.5" up to 12" x 34". Tri-zone ultrasonic multi-feed detection recognizes labels, sticky notes and stuck-together documents (common in mixed-batch scenarios) to maximize uptime. 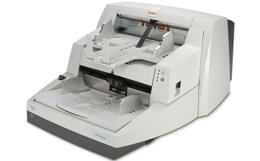 Discover true productivity with Kodak i700 Series Scanners. Based on technology that's proven in the real world, the i700 Series Scanners deliver reliability and speed that's true to spec. Physical dimensions 15.7 x 23.9 x 30.3 "
ADF Feeder Paper Size Max. - W x L 12 x 34 "